SHOUG is defined as a feeling of immense longing in romance and love, as translated from Arabic to English. 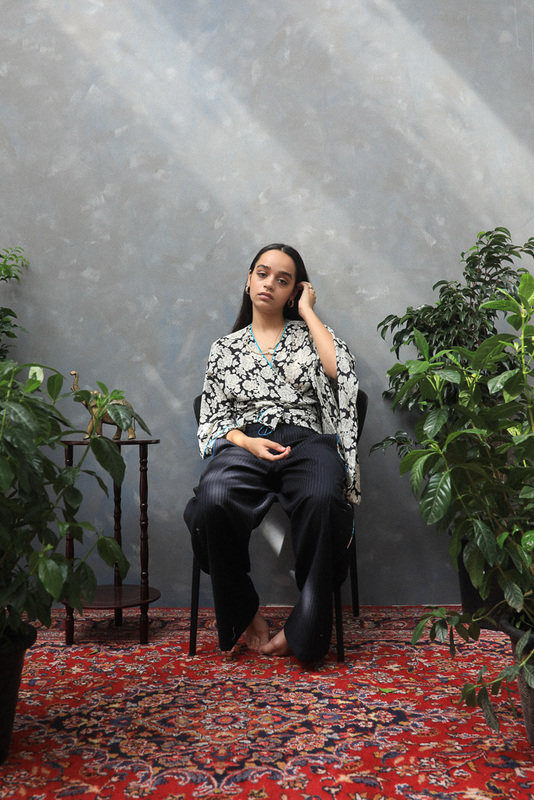 Shoug Fardan an Emirati fashion designer born in Dubai, founded her eponymous fashion label SHOUG after graduating from Parsons School of Design in New York with a Bachelor of Fine Arts degree in Fashion Design in 2017. From a young age Shoug was always exposed to the world of art and design. Her mother, Aisha Juma is a multi-disciplinary artist based in Dubai, and her grandmother was a seamstress from a young age. Shoug was always comfortable with many art forms, but fashion in specfic felt like a natural path. She fell in love with the tools of fashion like sewing, pattern-making, draping and working with fabrics and the human body. Tell us more about your latest project "IMPORTED". For my latest project entitled “Imported”, I started off in the garment district in Dubai looking at fabrics. I found myself drawn to prints. I knew that the prints I chose are heavily worn by local Emirati women around the house everyday and they felt very familiar. But I noticed that most of our prints, fabrics and daily household items are imported from abroad. We have converted them into our own tradition, and woven them into our culture. I love the idea of creating new traditions out of things that have been found or imported to us. I think that is what SHOUG is about, creating new traditions out of old ones. When shooting for this project, I brought in my grandmothers Iranian red carpet, my late grandfathers ornaments that he had around the house, and I added plastic flowers that can be found in many Middle Eastern homes used for decorations due to the lack of fresh flowers all year round. I painted a backdrop that resembles old photography studio backdrops. I even brought in three models to reflect my parents old photos where many family members are photographed together. Fusing together masculinity and femininity by putting together fabrics that are considered both striclty masculine or feminine in my UAE culture. How does "IMPORTED PART II" relate to the first launch and weave in the Holy Month of Ramadan? Each year for Ramadan/Eid season, I create an all exclusive limited edition collection. Bringing in classic timeless cuts. This year I incorporated prints that are made in India to stay true to the theme of “Imported”. I wanted to bring in things that are considered traditional to us, so when planning the photo shoot I brought in beautiful Iranian carpets that we use in our home. I wanted to keep the visuals clean and minimal this time. To the Arabian teen SHOUG is both modern and nostalgic, a brand that harnesses the aesthetic of homes we grew up in and adults we looked up too. A modest way of dressing that allows fabric to take precedent over form, a common case in Middle Eastern culture. Similar to the Iranian rugs that have become a classic motif in SHOUG's editorial, the garments that make up this brand feel timeless. You can check out SHOUG on Instagram and through their website.